Monday being a Bank Holiday, we'd wanted to do something fun for the girls (mainly ThingOne, since ThingTwo's idea of fun consists mainly of sitting and looking at us). ThingOne spent the first part of the morning in front of a Flickr Slideshow looking at pictures of Big Ben ("Very Big Ben", apparently) ("Big Ben is the bell, not the clock ThingOne", says Anne helpfully). We then trudged down to the train station in the wet to catch the train to Ely. 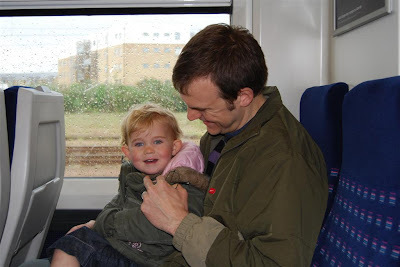 We had no plans to do anything in Ely, but ThingOne hasn't been on many trains, and has recently become very interested in Thomas the Tank Engine, so we thought she might like it. As predicted, the train was a big hit. ThingOne had a great time moving from seat to seat, and didn't seem to be confused that the trains didn't have faces. 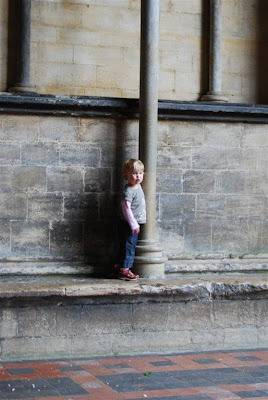 When we got to Ely we wanted to show her the cathedral, but they wanted £11 for two adults to go in ("the kids are free" they told us charitably, but we weren't going to pay £11 to show a 2 year old a church for the five minutes it took her to get bored). 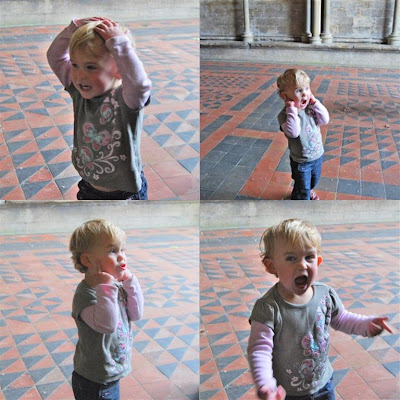 So I showed her around the entrance part, before you have to pay, and she had fun running around the font. I told her she had to be quiet in the church, but could be noisy in the outside part of the entrance. She took this seriously and ran around outside singing, shouting and generally looning for a good ten minutes or more. And all for free. Take that C of E! In Starbucks later ThingOne ate something off the table. We didn't know what it was, but it must have had egg in it (to which she's allergic), as she soon became very itchy. A quick dash to the chemist for some Piriton and she seemed much better, but by the time we'd gone home on the train and got back home she was shattered (I think anti-hystamin can knock you out a bit) and asked to go for her nap early, and didn't want a story. Unheard of!